Big, beautiful & rebellious indie film critic Daria MacClellan is most comfortable in a monster movie poster T-shirt and blue jeans. Yet when family drama hijacks her engagement, she's trapped into a formal wedding with her perfectionist, anorexic sister, Sky, planning the whole thing. Daria adores her fiance, but her wedding seems to be spiraling into a horror film. Will the spectre of a picture perfect wedding turn her into the Bride of the Living Dead? "Anyone needing a laugh-out-loud romance full of lovable and real people need look no further." "In Lynne Murray's fabulous version of romance, lovers find true pleasure in all body sizes and shapes, wedding dresses are altered to fit the happy bride's body (not bride made to fit brocade), and readers feast on smart detail and smarter dialogue. When they make the movie of this book, Renee Zellweger won't need to alter her diet or her weight to get a part and viewers will scream with delight!" "Bride of the Living Dead is an irresistible comedy that's got it all: a big, beautiful, witty heroine, true love, scary stalkers, reluctant in-laws and monster movie magic. Buy it, read it, laugh out loud and enjoy the heartfelt love story." "Jane Austen meets the Marx Brothers. Lynne Murray has written a delightful comedy of manners with impeccable politics." "From the start you will find yourself cheering for Daria as she overcomes hurdles such as a control-freak sister, his and her stalkers, and her own nagging self doubt, to marry her beloved Oscar. 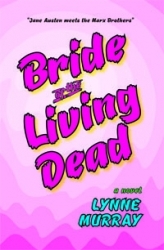 Bride of the Living Dead is a fun read about love, friendship and being true to yourself." Book 2 of the Josephine Fuller mystery series. Plus-sized PI runs into trouble while investigating do-gooders in San Diego. Trade paperback.